Ravers! 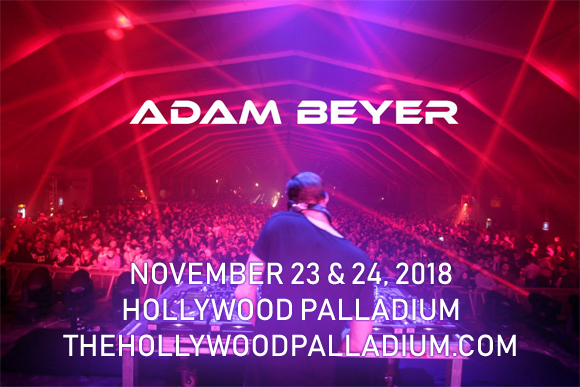 Get ready for an experience you'll never forget, as two of the hottest names in techno, Adam Beyer & Cirez D (aka Eric Prydz) come to Hollywood Palladium on Saturday 24th November 2018 in a rare and ground-breaking show! Fusing the music of these Swedish dance heroes together as they perform side-by-side, this event is a collaborative rave experience as exciting as it is bold! Swedish DJ and producer Adam Beyer had his breakthrough in the 1990s as one of several prominent Swedish techno artists. To date, Beyer has released four albums and several EPs, and is known as a remix artist. He continues to headline festivals and is a hot name on the global underground club circuit. Cirez D (aka Eric Prydz) found fame in 2004 with the release of his smash hit single “Call On Me”. Prydz had continued success throughout the noughties, with his hits "Proper Education" in 2007, and "Pjanoo" in 2008. Prydz released his debut album, Opus, in 2016. Under his Cirez D alias, Prydz releases dark, industrial techno.